Do you snore, have sudden night wakings, or wake up sleepy even after a full night’s sleep? If you answered yes to any of those questions, you may be suffering from sleep apnea. Those with sleep apnea are not only more tired than they should be, but, if the condition is left untreated, are at a greater risk for heart problems, cardiac arrest, or even a stroke. As you sleep, your tongue relaxes which can encroach on your ability to breath clearly. Instead, what ends up happening is the soft tissues in your throat begin to vibrate, leading to snoring. If it encroaches even futher into your breathing passage, obstructing your breathing, it leads to what as known as sleep apnea. The oxygen deprivation jolts you awake so you can breath again. This can happen many times throughout the night, without you even realizing it. A mandibular advancement device, such as the Somnodent used by Dr. Rothwell, can pull your lower jaw forward. This opens up your breathing passage and allows you to breathe normally and get uninterupted sleep. The first thing we’ll do is a sleep study. We use a Watermark, which is a home sleep test. That will help us determine if you need a more involved sleep study with a physician. If it is determined you have sleep apnea, we’ll fit you for a somnodent appliance. 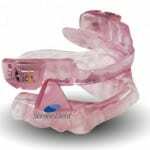 This fits like a mouth guard while you sleep and moves your jaw forward slightly opening up your breathing passage. If you suspect you have sleep apnea, you may call our office to schedule an appointment. If you prefer, you may click here to request an appointment online.